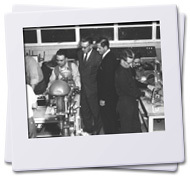 This timeline places the history of the St. Louis Electrical Industry Training Center within the larger context of the development of the electrical industry. St. Louis has played a significant role as the birthplace of the IBEW and the home of many electrical innovations since the late 1800s. 500 BC Greek philosopher-mathematician Thales observes that rubbing a piece of amber with cloth or fur causes the amber to attract small objects and then repel them again. Nothing comes of the observation. 1600 Englishman William Gilbert, physician to Queen Elizabeth, publishes book, De Magnete, in which he explains the force of magnetism and names the force "electrica," the Greek word for amber. 1800 Italian Allesandra Volta makes a pile of silver and zinc discs and placed bits of cloth soaked with salt water between them. From such an arrangement (called a voltaic pile), he obtains electricity. The unit of electrical pressure (volt) is named in honor of Volta. 1820 French Andre Marie Ampere discovers that a coil of wire through which electric current is passed assumes the properties of a magnet. This demonstrates the long sought connection between electricity and magnetism. The unit of flow of electric current is named ampere to honor him. 1825 French Georg Simon Ohm advances the theory that current flowing in a circuit equals the voltage divided by the resistance. Detractors ridicule Ohm and manage to get him discharged from his position as a high school teacher. 1831 British Michael Faraday and American Joseph Henry come upon the principle of electromagnetic induction about the same time while working independently of one another. This discovery leads to development of the dynamo as a source of electric power. 1841 Ohm's theory is upheld by the Royal Society in London and Ohm is presented with a medal. The unit of electrical resistance (ohm) is named in honor of Ohm. 1844 First telegraph wires strung between Washington and Baltimore carry message of Samuel Morse, "What hath God wrought?" 1848 Chicago becomes home to first telegraph station. 1861 Web of telegraph lines is completed for the United States, augmented by a transatlantic cable five years later. 1876 Arc lighting is a feature of the Philadelphia Centennial Exposition. Arc lights were too bright for interiors, and gas lighting remained the preference. 1877 Thomas Alva Edison of Menlo Park, N.J., joins other inventors in quest to invent incandescent lamp. At age 30, he has already invented the stock ticker, the telephone transmitter, multiplex telegraph and phonograph. 1878 Two Gramme dynamos imported from Paris are used by Carl Heisler to light the Tony Faust Restaurant at Broadway and Elm streets in downtown St. Louis. A Hochausen arc machine is used as a street light on the same corner. The St. Louis city library is also electrically lighted. 1879 On Oct. 19, sewing thread carbonized in an oven and housed in a glass globe vacuum burns for 40 hours until Edison broke the filament by testing higher voltage through it. The incandescent lamp was born, beginning a worldwide revolution in lighting. Stock in the Edison Electric Light Co., formed in 1878, gained nearly $1,200 per share almost overnight. 1880 The Turner Building at Eighth and Olive streets downtown is first large office building in St. Louis to be lighted electrically. 1881 Beers Hotel at Grand and Olive streets is first St. Louis hotel to be wired electrically. 1887 St. Louis introduces electrically-operated streetcars. 1889 St. Louis holds its historic Exposition of Light, wired by electrical wiremen and linemen from throughout the United States. Linemen risk their lives on high lines for 12 hours a day in any kind of weather, seven days a week, for 15 to 20 cents an hour. $2.50 a day is considered an excellent wage for wiremen; many accept work for $8 a week. Apprenticeship training and safety standards are nonexistent. In some areas, the death rate for linemen is one out of every two hired. Nationally, the death rate for electrical workers is twice that of the national average for other industries. 1891 International Brotherhood of Electrical Workers (IBEW) forms in St. Louis, assisted by the American Federation of Labor (AFL). St. Louis lineman Henry Miller is elected president. J.T. Kelly, first secretary of the IBEW, reflects later, "No man could have done more for our union in its first year than he did." Miller works to organize locals in many other cities, including Chicago, Milwaukee, Evansville, Louisville, Indianapolis, New Orleans, Toledo, Pittsburgh, Cincinnati, Duluth, Philadelphia and New York. The first IBEW convention is called in St. Louis on Nov. 21, 1891, meeting in a small room above Stolley's Dance Hall at 1309 Boyle Ave. in St. Louis. 1893 IBEW institutes three-year, on-the-job apprenticeship training, just two years after founding of IBEW in St. Louis. 1894 Union Station at Market and 18th streets opens in St. Louis. 1897 New St. Louis ordinance requires all wires throughout the St. Louis business district to be placed underground. St. Louis becomes the model for many cities anxious to see the underground alternating current system and arc lights, as well as large single-phase motors, operating on the same circuits as incandescent lights. 1904 An International Exposition (World's Fair) opens in St. Louis to commemorate the centennial of the 1803 Louisiana Purchase. Seven St. Louis electrical industry entrepreneurs electrify the Fair, gaining the contract by offering an unprecedented one-year installation warranty to World's Fair organizers. 1919 James P. Noonan, a former lineman and vice president of the IBEW from St. Louis (and grandfather of Dennis Gralike, currently director of the St. Louis Electrical Industry Training School), becomes acting president of the IBEW International to replace then-president Frank McNulty upon McNulty's appointment to the Railway Adjustment Board. Noonan serves until Dec. 4, 1929, when he tragically burns to death while asleep in his Washington, D.C. residence. 1923 St. Louis' last gas streetlight is replaced with an electric alternative. 1941 St. Louis' union electrical construction industry becomes first entity in nation to register its training standards with the U.S. Department of Labor. 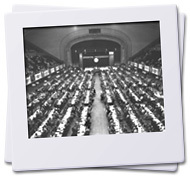 1944 IBEW and NECA broaden educational efforts to encompass training programs in new war-related industries, such as electronics and television. Urging journeymen electricians to retrain themselves to meet the needs of this expanding field, the IBEW and Marquette University's College of Engineering, Milwaukee, Wis., establish a six-week training course to teach IBEW members how to service and maintain electronic equipment. Graduates serve as instructors when returning to their locals, with a goal to train at least 20,000 IBEW members in a year's time. 1945 Over the course of World War II, at least 35,000 IBEW members serve in the armed forces. At home, IBEW members install 95 percent of electrical work required for the war, and their technical skills help engineers speed production of military hardware, ammunition and vehicles for use overseas. Electrical workers also help implement new technologies, such as radar. 1947 St. Louis' first formal union electrical construction industry training includes one-half day of weekly classroom training, with contractors paying apprentices to attend classes at what was then Hadley Technical High School at 3405 Bell Ave. Journeyman training is achieved in a four-year apprenticeship. 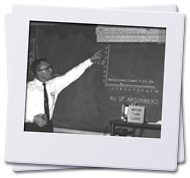 1955 St. Louis Electrical Industry Training Center appoints H. Lee Bruns as training director. 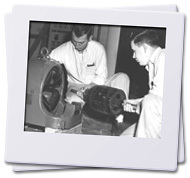 1956 Industry initiates night school program to help IBEW journeymen and contractors stay abreast of rapid technological changes. 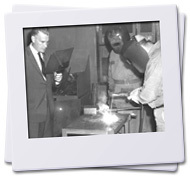 1959 IBEW appoints a skill improvement training director so journeymen members can keep up with technological advances. Crash courses are developed to prepare IBEW members to work on missile installations and industrial electronics, including course materials and workbooks. 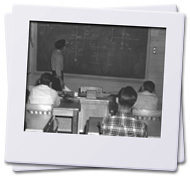 1960 St. Louis' union electrical construction industry doubles its training commitment by expanding classroom training to one day of paid time each week. The program moves to O'Fallon High School, on McRee Avenue in midtown St. Louis, to accommodate the expansion. 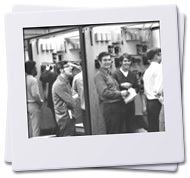 1965 St. Louis Electrical Industry Training Center appoints Mike Gibbons as training director. 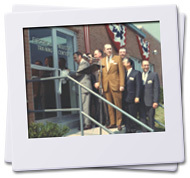 1967 Industry constructs 35,000-square-foot permanent home for the St. Louis Electrical Industry Training Center at 2300 Hampton in the city of St. Louis. 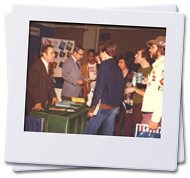 1976 St. Louis Electrical Industry Training Center appoints Donald Gralike as training director. 1995 Seven night school classes are offered to journeymen wanting to hone skills and expand knowledge. 1995 St. Louis Electrical Industry Training Center appoints Dennis Gralike as training director. 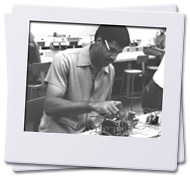 1999 St. Louis' union electrical construction industry invests $1.5 million in its training center to accommodate new training programs in every realm of technological advancement. In March, the communication technician training program standards are approved by the U.S. Department of Labor and fully implemented in St. Louis. 1999 Commercial-industrial electrician training program expands classroom instruction to 960 hours within 8,000-hour, five-year apprenticeship training program to meet expanding knowledge requirements of professional electricians. Rigorous studies qualify apprentices for up to 47 college credits (link to college credits section in About Us) upon completion of the program. The 6,000-hour residential electrician and communication technician apprenticeship programs include 450 hours of classroom instruction. 2000 Nearly 800 journeymen electricians and communication technicians participate in night courses to stay abreast of changing technology and practices. Course duration ranges from six weeks to 25 weeks, generally meeting three hours one night per week. 2004 St. Louis Electrical Industry Training Center is staffed by eight professional teachers, including Director Dennis Gralike and Assistant Director Stephen A. Licari. The full-time teaching staff, all certified by the Missouri Department of Elementary & Secondary Education, possess a combined total of more than 175 years experience in the field and average more than seven years each as teachers. 2004 Expanding educational needs leads IBEW-NECA trustees to purchase additional classroom space for journeyman training at 5735 Elizabeth, just east of the St. Louis Electrical Industry Training Center. 2007 Nearly 2,500 IBEW Local One members became OSHA Certified through a cooperative effort between IBEW Local One and the National Electrical Contractors Association, St. Louis Chapter. 2009 Green Technologies Training program is introduced through the NJATC. 2011 A comprehensive Electric Vehicle Infrastructure Training Program (EVITP) is presented through the NJATC.